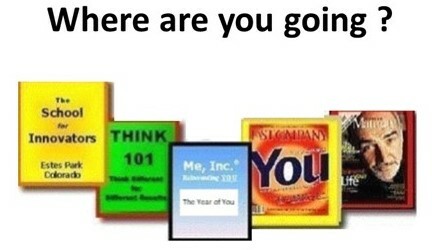 Where are you going in 2018? The School for Innovators has developed a process for reinventing yourself and mentally incorporating as Me, Inc., a wholly owned subsidiary of who you really are and who you want to be. How to explore and discover your vision, mission, values, principles, goals, critical success factors, strengths and skills - and a strategy and action plan for going forward into the future on Expedition! Have you ever thought about reinventing your life? Changing careers? Starting over in a new city or with a new purpose in life? Modern Maturity Magazine helps you get started, with inspiring stories from people who've done it, plus 25 ways to jump-start your life. How about working on "The Brand Called You"? Tom Peters points out that big companies understand the importance of brands. Today, in the Age of the Individual, you have to be your own brand. Here's what it takes to become the CEO of Me Inc. and develop your unique value proposition. FAST COMPANY Magazine, Aug/Sep 1997.